Menopause Support – Soy Isoflavones for all stages of the menopause. A unique formulation of isoflavones from fermented soy, magnesium and hibiscus. Our soy isoflavone product is obtained using an extract of fermented soya beans and provides 50mg of bioavailable phytoestrogenic soy isoflavones or 24mg of genistein daily, shown by research to be the right dosage. * This unique formulation also contains magnesium (known to help with symptoms such as tiredness and fatigue), hibiscus and vervain. The 2015 NICE guidelines for menopause (2015) confirm there is some evidence that isoflavones may relieve vasomotor symptoms (in other words, flushing and temperature changes). Using fermented soya beans means that the important phytooestrogenic soy compounds (genistein, daidzein and glycitein) are more easily absorbed by the body. If hot flushes, excessive sweating or night sweats are your main menopausal symptoms, you might like to consider using Menoforce Sage Tablets- a licensed herbal remedy formulated specifically to treat menopausal hot flushes and night sweats. Obtaining isoflavones from fermented soy means that the important active ingredients are more easily absorbed by the body. Isoflavones found in soya beans are plant chemicals known as genistin and daidzin. These are not biologically active – they do not act as phytoestrogens. When we ingest soya products based products, acid in the stomach and bacterial enzymes in the intestines convert these molecules to genistein and daidzein (note change from –in to –ein). It is this form of isoflavones which are active. If you don’t have a good digestive system or gut flora, this conversion does not take place adequately – this means that you may not get the benefits of what you are taking. It is thus better to take a supplement containing isoflavones which have already been converted such as with fermented soy extracts. Historically, soya consumption in East Asia where menopausal symptoms are unusual has been in the form of fermented soya products such as soya sauce, miso and tempeh, rather than soya milk and soya vegetable protein that is consumed in the West. 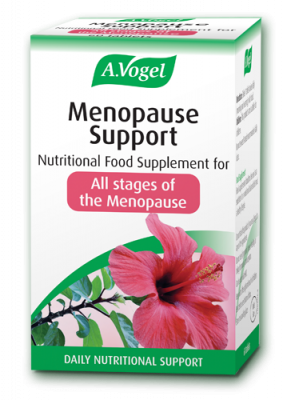 Each tablet of Menopause Support contains 42mg of fermented soya bean extract, providing 25mg of isoflavones. Of those, 11.5mg are genistein, 11.5mg daidzein and 2mg glycitein. Menopause Support is a herbal food (dietary) supplement. Each tablet contains 405 mg of tri-magnesium dicitrate anhydrous, 42 mg of fermented soy bean extract (60% isoflavones), 35 mg Hibiscus extract and 0.25 mg Vervain essential oil. Also contains microcrystalline cellulose, Beta vulgaris (beetroot juice) powder and magnesium stearate (vegetable source). GM free. Suitable for vegetarians and vegans. 1 tablet contains 56.7mg elemental magnesium. Take 1 tablet twice times daily (morning and evening) with food. This product is not suitable for children. Food supplements should not be used as a substitutefor a varied and balanced diet and a healthy lifestyle. Do not use if pregnant, breast-feeding or taking hormonal contraception. Can be used with HRT.